One of the reasons gum disease is such a problem is that it progresses gradually, often with no pain during the initial stages. Gums that bleed when brushing or flossing – No amount of bleeding is normal. Red, swollen, or tender gums – Redness can be a sign of irritation or infection. Gums should be a healthy shade of pink or coral. Bad breath – Gum disease can be a major contributing factor to persistent bad breath (halitosis). Gum recession – Unhealthy gum tissue may begin to recede and pull away from the tooth. Loose permanent teeth – As periodontal disease progresses, it can further break down the gum and connective tissues that hold teeth in place. Teeth fit differently when biting – Any noticeable difference in your mouth should be investigated, including changes to bite/alignment of teeth, partial dentures, or other restorations which may have loosened or shifted due to gum disease. 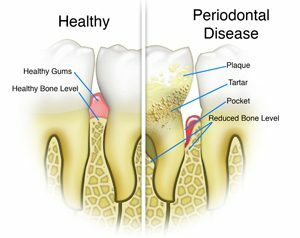 If you have one or more of the above symptoms, schedule an appointment to be evaluated for periodontal disease.